For the past couple of days, I have been scrambling to put together a presentation on fossil hunting in Manitoba’s limestones for a public open house session at the Manitoba Mining and Minerals Convention. If you are in the Winnipeg area, you might want to check out this session on Saturday morning, which includes several presentations on geological and paleontological topics. ﻿A significant proportion of Manitoba is underlain by carbonate bedrock that is often rich in fossils. In the south, limestones and dolostones occur along the margin of the ancient Williston Basin, from Winnipeg north along the lakes to the Grand Rapids Uplands and the Cranberry Portage area. These rocks, dating from the Ordovician to Devonian periods, are about 450 to 370 million years old. In the north, equivalent rocks occur in the Hudson Bay Basin, and are well known from Churchill to the Nelson River. All of the fossils in these rocks represent sea life. During this time, Manitoba was at or near the equator. Sea level was often very high, so that warm seas covered much of what is now land. 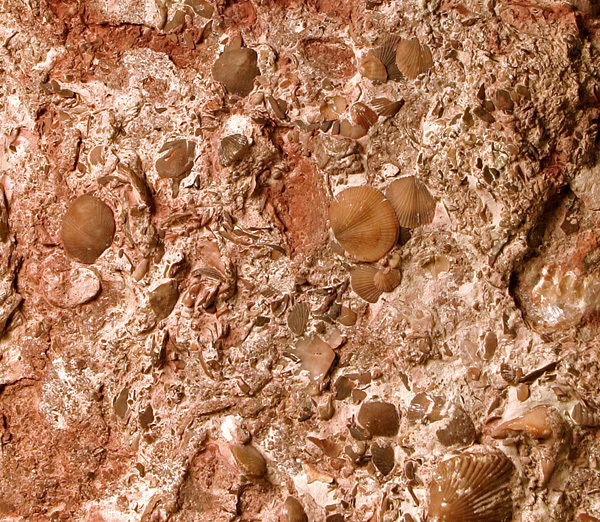 Fossils found here include many groups of marine organisms, such as corals, brachiopods (lamp shells), trilobites, receptaculitids (“sunflower corals”), and nautiloid cephalopods. Other fossils, such as fishes and seaweeds, are much rarer and only occur at certain sites. All of the fossil species in these rocks are extinct, although some of them have living relatives. This presentation will include brief explanations of some of the fossil groups, describe where they can be found, and suggest preferred collecting techniques. Is the whitish color due to phosphate precip? I see that in my local rocks(Ord. carbonates), but not as prevalent. In this particular sample, the whitish parts are just areas where there is less iron oxide (maybe it has been leached out, or there was less there to begin with?). But we do have issues at that site with sulfates, and particularly with sulfides along fracture zones.